Our design and installation team optimized this bathroom’s layout to accommodate a larger vanity and custom shower. 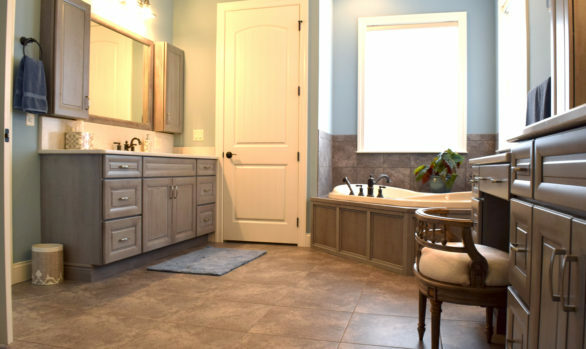 This remodeled bath includes a recessed heated towel bar and heated tile floor. Both features are sure to keep the homeowner warm in the winter. Speaking of the homeowner, he designed the over the toilet storage cabinet, and we made it according to his specifications. The mirrored door conceals the face frame, and a touch latch opens the door. The custom made cabinet looks like a framed wall mirror, but it’s really a cleverly hidden cabinet. • Includes countertop splash, shower wall cap, curb, and foot rest.